Amid a recent flurry of announced investments in the booming Mexican auto sector (totaling no less than $3.5 billion USD between Ford and Toyota), a cold hard fact is increasingly impossible to ignore: overall foreign direct investment (FDI) in Mexico has been nothing short of mediocre in recent years even despite the country's post-crisis hype. In 2014, FDI in Mexico reached $22.6 billion, a seemingly impressive figure until it is compared with Brazil, which despite finding itself in the economic doldrums and lambasted for its red tape, high taxes, rigid labor market, and protectionist tendencies, has managed over $60 bn annually since 2011. Even more astonishing is Chile, an economy barely one-fifth the size of Mexico's but which received $23.3 bn in 2014. As a share of GDP, Mexico's FDI intake was barely 1.8 percent in 2014 which not only is the lowest among the major Latin American economies that aren't international economic pariahs (i.e. Venezuela) but lower that some regional trouble spots like Honduras (over 5 percent!). 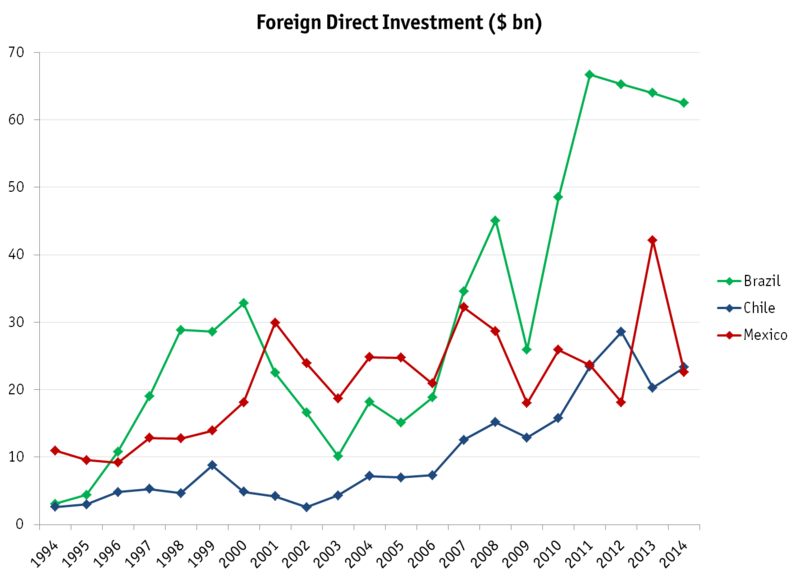 One factor that explains why Mexico has had such a poor showing with regards to FDI over the past few years is that it lacks an attractive commodities sector which in other countries has been one of the major recipients of FDI as a result of the commodity super-cycle. The share of mining FDI in Chile, for example, has averaged over 40 percent of the total in the last five years compared to less than 10 percent in Mexico. Mexico's only major exportable commodity is oil, but the sector has been a public monopoly and is only gradually opening itself to foreign participation as a result of the 2013 energy reform. Other sectors that could potentially be high FDI recipients have seen little foreign interest due to market characteristics or competition conditions. The telecommunications sector, for example, is a tight duopoly (with Carlos Slim's Telmex/América Movil as the major player) that makes even big multinationals think twice before challenging. Retail already has one large and dominant foreign firm, Walmart, and a few strong local players like Chedraui and Soriana. Banking is another sector that in many countries receives a particularly large share of FDI, but the Mexican financial system is already almost entirely foreign-owned: around three-quarter of assets and the loan portfolio are held by Citigroup, BBVA, HSBC, Santander and Scotiabank. 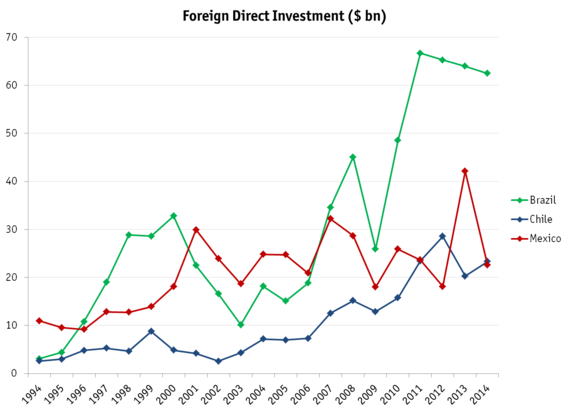 Notably, Santander actually divested some of its assets back in 2012 to raise capital for its struggling Spanish business, bringing down total FDI to its lowest level relative to GDP since before NAFTA. Lastly, there is tourism but high drug-related crime in many resort towns is not conducive for high inflows. This leaves manufacturing as the only true star performer with regards to FDI: it accounted for $12.9 bn in 2014, which represents a massive 57% of the total. The idea that the structural reforms would unleash a flood of FDI has not yet materialized and two disappointing tenders have raised concerns that the reality of "Mexico's Moment" has yet to meet expectations. The first was the tender for a bullet train between Mexico City and Queretaro, which would have been Latin America's first. In the event, the tender received just one bid, from a consortium led by China Railway Construction Corp (CRCC) in partnership with a pair of local construction firms. Worse yet was the fact that the bid was subsequently cancelled due to concerns that the single bid was too suspicious: one of the local partners in the consortium was Grupo Higa, a firm with close ties to the president, Enrique Peña Nieto, and that has been at the center of the corruption scandals involving the first lady and the finance minister. Plans for a re-launch of the tender were scuttled as a result of recent budget cuts announced early in the year but the government still has to foot a hefty compensation bill to CRCC, as well as deal with the souring of its economic relationship with the Asian giant. The second tender was one of the centerpieces of the vaunted telecommunications reform, and was to result in two new television networks that could hopefully challenge the Televisa/TV Azteca duopoly. It was hoped that some foreign TV networks would participate in the tender but in the event, not a single one did. Only two bids were received, by a local radio group (Grupo Radio Centro) and another local conglomerate that owns just one TV channel (Cadena Tres) but then disaster struck: Grupo Radio Centro failed to raise the necessary capital to pay the deposit on its bid, resulting in an automatic cancellation when the deadline expired. There is still no word on whether another tender will take place for the additional network but as it is, neither Televisa or TV Azteca are likely to be breaking a sweat over their new competitor, which has neither the experience on a national level or the financial muscle to challenge them, something that would have only been possible if it had partnered with a major foreign player. Going forward, all eyes will be on the energy reform and the ongoing Round 1 of bids where mostly onshore and shallow water sites will be auctioned off. Further rounds will involve the more lucrative (but more costly to extract) deep-water and shale sites but already the government has announced that some of them will be delayed until oil prices recover, anticipating a lack of interest. The government will take a huge hit to its credibility if the reform underwhelms, especially considering its political cost. 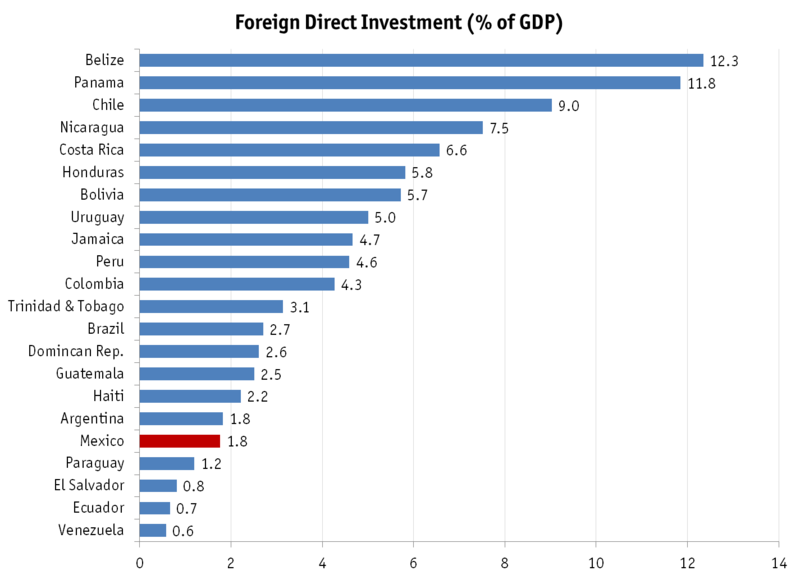 With the above in mind, the main reason for Mexico's disappointing performance on the FDI front compared to a nominally less attractive Brazil should become patently obvious: liberal and open economic policies do not compensate for an uncompetitive domestic market that remains captured by oligopolies. While the government will boast of the few mega-investments in the manufacturing sector (which typically only amount to one or two a year), a larger number of much smaller inflows into the consumer-oriented service sector are what have pushed Brazilian FDI beyond the $60 bn mark consistently this decade (around half of FDI has been received by services in 2011-13). Much of this has been driven by the rise in purchasing power by the Brazilian middle class during the pre-crisis boom years thanks to a reduction of poverty and inequality. Mexico, meanwhile, has seen negligible improvements on the social front during this time and the fact that the country's "wage competitiveness" has worked against it in terms of its attractiveness for FDI outside of manufacturing is an irony that should not go unnoticed. If Mexico wants to raise its FDI/GDP ratio to a more respectable level of around 3-4% (commensurate with a more mature but still dynamic developing economy) it cannot bank on the manufacturing sector alone. Given that future energy investments may fall short of expectations due to the oil price slump, the country's best bet for FDI is to develop a competitive domestic economy, bring down its shamefully high poverty levels (45.5% in 2012) and to raise the purchasing power of its fragile working and middle classes.